The Winter/Spring Schedule is underway! You'll find a complete list of all stops here. We hope we see you on these or any of our other stops soon! Remember, all Bookmobile stops are open to the public, even those at elementary schools. We currently have toys available for checkout on the Bookmobile! You'll find the selection near the front desk. Feel free to browse during your next Bookmobile visit and check out a toy for three weeks. Sweet Reads, the Library's Winter Reading Program for children ages three to 12, may be underway, but there's still time to sign up. In fact, you can register on the Bookmobile! Register for Sweet Reads on the Bookmobile today! 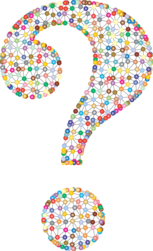 What does Bookmobile maintenance include? The Bookmobile was off the road Dec. 21 through Jan. 6 for scheduled maintenance, as well as collection updates and staff training. 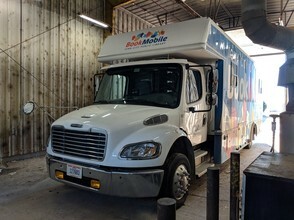 Like all automobiles, the Bookmobile undergoes regular maintenance to ensure it's running in top condition and able to deliver materials around the city. During its most recent stay at the City of Iowa City Equipment Division, the Bookmobile's oil was changed and its front steps were fixed. The door lock was fixed and the heating system was checked. The Bookmobile also was washed from top to bottom, making it all shiny for the Winter/Spring schedule. We thank all the staff at the City of Iowa City’s Equipment Division for their hard work in keeping the Bookmobile in tiptop condition to better serve our patrons!